In case you can’t tell from the title, giant slice of honeydew, or honeycomb in the picture, this Booklish is for a humble little children’s book, Matilda by Roald Dahl (1988). 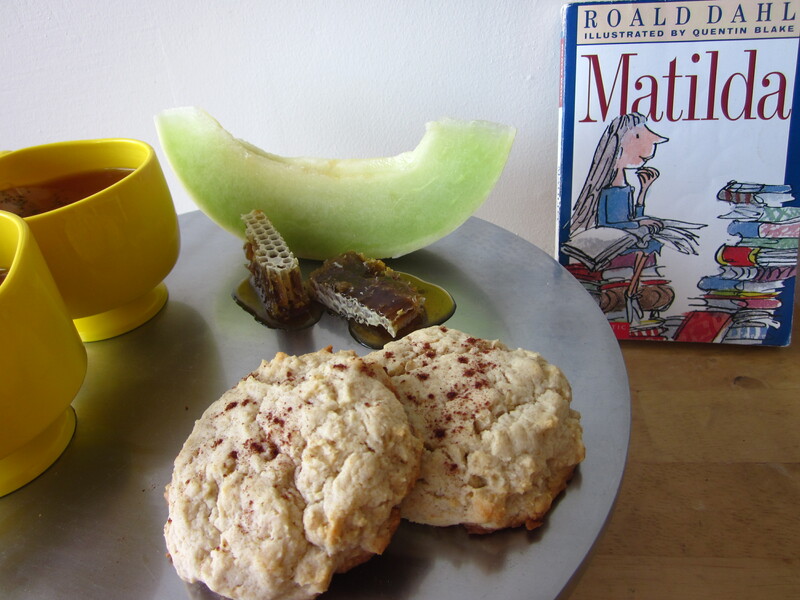 Specifically, Miss Honey and Matilda are at the center of this feature today and this Booklish is an imagined meal for the two. 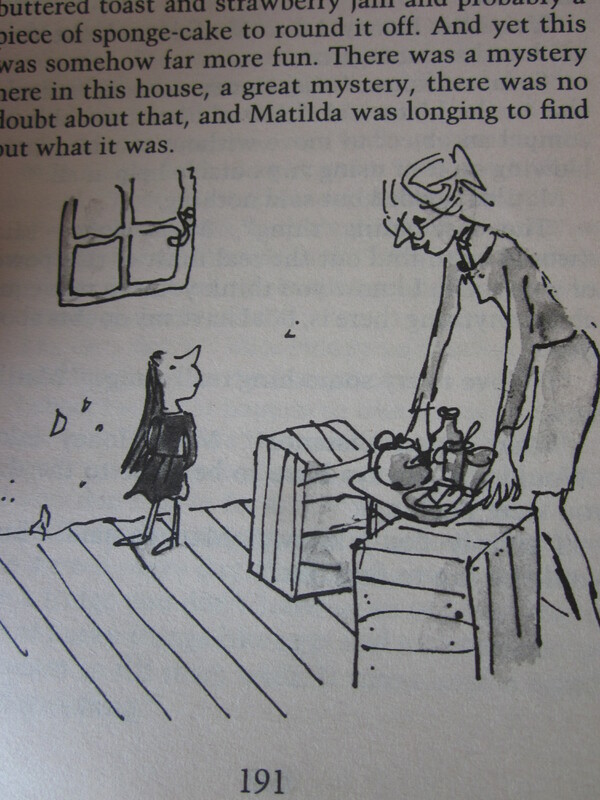 The heart of Matilda lies in the scene in which Miss Honey invites Matilda to her cottage for some tea and bread. For the first time, Matilda experiences the security, comfort, and love that comes from having an adult care for her and treat her as a unique and intelligent human being. It is here in the cottage that Miss Honey and Matilda’s trust and relationship begins, and it begins simply and inquisitively. …Matilda was appalled. Was this really where her neat and trimly-dressed school teacher lived? 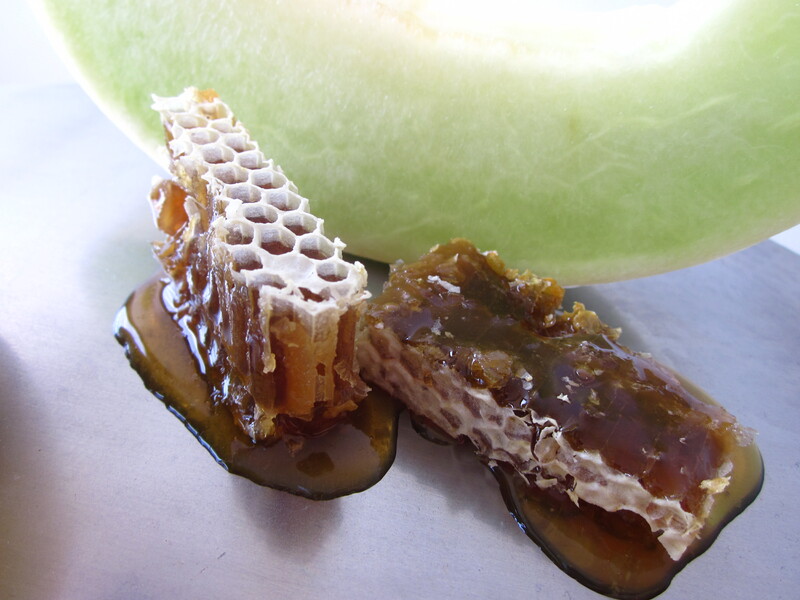 I was particularly inspired by this chapter to create something likewise simple but flavorful while keeping in mind some of the quirky aspects of Ms. Honey and Matilda’s meeting. I remembered that Miss Honey did not have sugar in her tea for it was too expensive, and so I went for a taste that was light on processed sugar and more reliant on the taste of honey. There is a subtle hint of cinnamon in the scones, a little reminder of the magic in the book as well as what brought them to the cottage. And finally, margarine for butter. For almost 5 years after reading Matilda, this passage was responsible for confusing me immensely about margarine. I would watch whether my mother bought margarine or butter from the store to ascertain whether we were rich or poor, but only when I was older did I realize she simply went for whatever was on sale. I also remember sneaking tastes of each to figure out what “poor” and “rich” tasted like. “Yes,” Miss Honey said. “Very. It’s a good little stove, isn’t it?” The Primus was roaring away with a powerful blue flame and already the water in the saucepan was beginning to bubble. Miss Honey got a teapot from the cupboard and put some tea leaves into it. She also found half a small loaf of brown bread. She cut two thin slices and then, from a plastic container, she took some margarine and spread it on the bread. Margarine, Matilda though. She really must be poor. Overall, I hope that the presentation is something Matilda and Miss Honey might enjoy in their new mansion, now able to afford fresh fruit, honey, sugar in their tea, and scones instead of plain bread and margarine. Thanks for this simple and lovely meditation on my always-favorite Dahl book. Mostly it was hot chocolate she made, warming the milk in a saucepan on the stove before mixing it. Occasionally she made Bovril or Ovaltine. It was pleasant to take a hot drink up to her room and have it beside her as she sat in her silent room reading in the empty house in the afternoons. The books transported her into new worlds and introduced her to amazing people who lived exciting lives. She went on olden-day sailing ships with Joseph Conrad. She went to Africa with Ernest Hemingway and to India with Rudyard Kipling. She travelled all over the world while sitting in her little room in an English village. Oh Kakaner, you always cease to amaze me with your wonderful booklish creations. 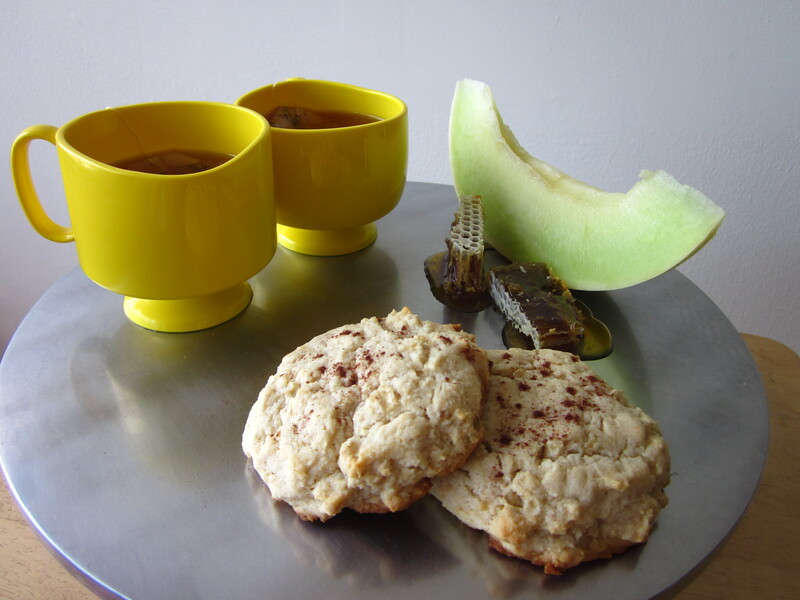 I actually made these scones last night and they were delicious. Well actually my roommate made them, but I helped! Anyways, I can’t wait for the next one! I wonder how Miss Honey avoids getting burgled in the cottage, if there is no key at the front door, even if there wouldn’t be much to take from her. I assume it was the kind of small town where people regularly left their doors unlocked – but it does also seem like a sad statement about how little Miss Honey would have to steal.